I believe mine is an 18" I'll verify that and post a picture for you tonight. The buffeting on the 2003 I just got isn't bad - it just isn't a cheeseburger in paradise. Speaking of cheese, I have the grilled cheese mirrors off a Bandit on it and I need to take those off to see if it gets better or worse. 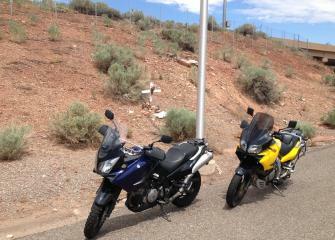 I do recall the first ride with the stock bars being worse so I think the straighter MSR bars helped. I just don't know if I can warrant $300 for a shield/bracket. The 04-12 headlight brackets come up on flea bay a lot for $100 and I could just cut holes in the plastic for them to poke through...but then I'm not gonna be getting the rest of the brackets and shield for less than $200 so $300 sounds fair. I need to peruse ST and see the results of some early experimental drilling/cutting before I drop that kind of coin. The OEM shield was good enough for a couple of fairly comfortable 650 mile days. 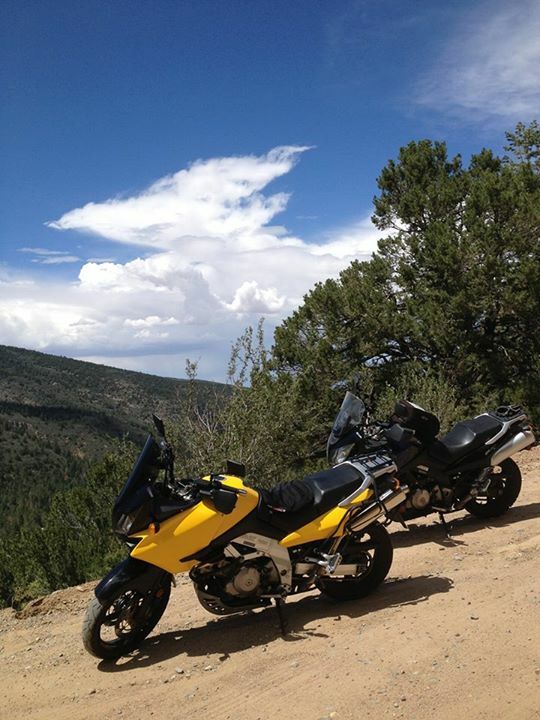 Mine is the zero gravity sport touring screen. Here is a picture of it and I didn't measure it yet (as I'm not sure where to start the measurement). But it is at least 18 inches. I just got the bike and have had it on a couple long rides but have not noticed much buffeting. Last edited by ªƒõr†uñª†ë për§õñ; 08-15-2013 at 11:43 AM. Measurement of my zero gravity is 18.5 from bottom of the v to the top. As I said I don't notice much buffeting at all but my buddy did point out that I'm used to a cruiser with no windscreen at all. 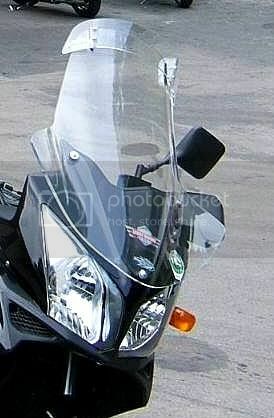 I have been using the WindStrom windshield on two DL1000's for many miles to resolve the typical buffeting and noise problems. 2009 Wee ABS 51,000 mls, still here, and a favorite! Hello, I am a newbie here, having just purchased a 2011 1000 V-Strom. I have read a lot about the buffetting on the bikes prior to buying this bike. So far it does not seem to bad, however I am riding it to Calgary this weekend, so we will see. I also own a 1981 Honda CBX, that with the stock shield, was absolutely brutal with turbulence. I decided to purchase a Rifle shield for it, and it is absolutely awesome, best, quietest windshield I have ever had. I received my Madstad bracket and 20" wind screen this week. I had just finished a 1000km trip through New Brunswick using the stock screen. So far, there is a large improvement in buffeting. I took the bike up to 150km/hour and had no impact on my vision, whereas with the stock screen, my vision would blur from buffeting at about 120km/hour. There is still wind hitting you, as these screens are designed to allow air underneath. The difference is that it is smooth clean air that doesn't rock your head all over the place. 08 Wee Strom - Givi luggage rack, Givi crash guards, Givi Trekker luggage, Fork Brace, Madstad Bracket and Windscreen, Go Cruise Throttle Lock, Oxford heated grips, Air horn, Grip Puppies, Centre Stand, Extenda Fenda, Storage Tube, Battery Meter, Cramp Buster. Pretty cool trick they did there. My stock screen is cut down big time, but I am still getting tossed around quite a bit. But I am a rather large sail in the wind if you know what I mean. Will this help highspeed (as in 80 mph) stability much? 6'-3" tall 34" inseam, Suzuki gel seat, 06 DL1000. I went with the Madstad 22" ADV shield and brackets. So far after many, many, many tries my favorite position is all they up and tilted back mildly. Pivot screw in the lower hole, brackets mounted mid way. About 80% less buffeting over 60 mph and almost none at lower speeds. I keep the same angle and drop it all the way down for a smooth blast of wind to my shoulders for hot weather. Set high it keeps the bugs off my helmet and I can lean over the tank and look through for a fairly quiet pocket of air. If I tilt it forward and look through the shield its really smooth but, I hate looking through it. I rather have a little rough air and look over. Its about 2" below my sight line raised up and tilted back where its best for all around use. Using the second pivot hole was best for me, less air under the shield I think. 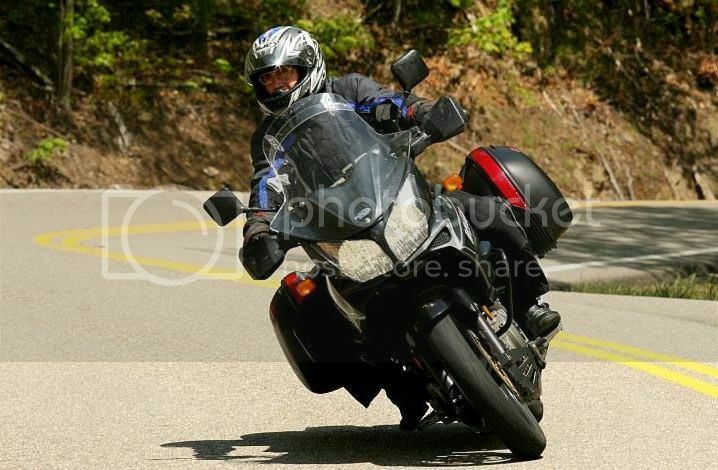 I can ride with my helmet open if I want too, much better air flow for an open shield with sun glasses. No bugs slapping you in the face or messing up the helmet. Much better than stock at least. I think the Madstad brackets help the most. Last edited by Sagebrush; 09-29-2013 at 11:00 PM.